Psychologist’s Discounts | American Professional Agency, Inc.
Our Psychology Professional Liability Discounts are available to all applicants based upon your qualifications and approval. Please contact our customer service department to discuss your requirements. A 35% discount is available if you are a new graduate. If you belong to one or several of the following associations you are eligible for a 20% discount in total from this category. A 10% discount is available if you do not practice in a prison setting. This credit is not available in the following states: Alaska, Hawaii and Kansas. policy), you are eligible for a 10% new business discount. Continuing Education Credit Discount: This discount applies only to the individual insured who meets our underwriting criteria for the Continuing Education Credit Discount. Therefore, only apply the discount to the rate that applies to that individual when computing your premium. 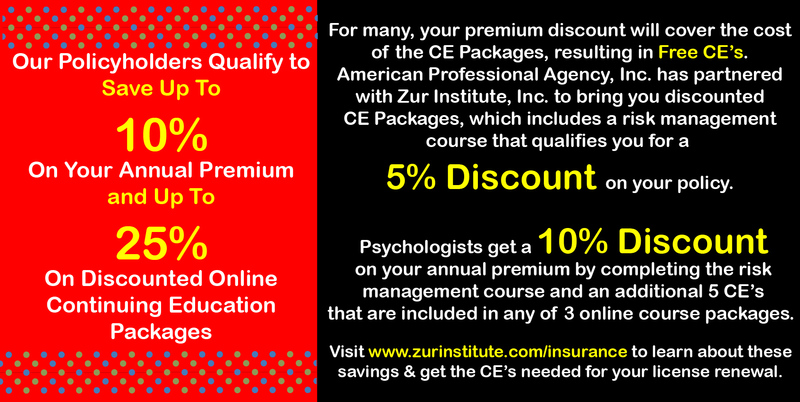 You are entitled to a 5% discount for the completion of 6 CE credits approved by your state or national psychological association or by your state licensing board. You must forward proof (certificate of completion) to this office that you have received 6 CE credits. Please note: If you are a policyholder in Texas please contact riskmanagement@awacservices.com for additional information on how to access risk management courses for Texas policyholders.